This paper emphasizes the importance of identifying changes in financial cycles when predicting monthly US excess stock returns for the period 1977 - 2017. Incorporating regime switching into the predictive models improves the quality of the excess return forecasts in terms of market timing ability, economic value and stability. 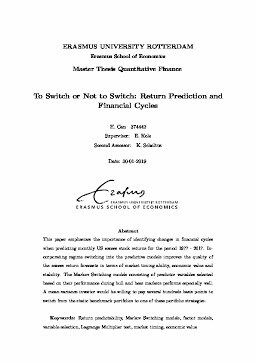 The Markov Switching models consisting of predictor variables selected based on their performance during bull and bear markets performs especially well. A mean-variance investor would be willing to pay several hundreds basis points to switch from the static benchmark portfolios to one of these portfolio strategies.